When four-year-old Zuri Pi wakes up one morning and has to face her first day of preschool, she is not a happy camper. She imagines all the things that can go wrong: the class fish may turn into a shark and eat her; her snacks may turn into chocolate-covered ants; no one will want to play with her during rug time…But her worst fear? “Mommy, what if you forget to pick me up?” says a worried Zuri Pi. That’s when her mother comes up with a clever and practical solution that all parents will want to try to ease their child’s concerns. This engaging board book forms part of the “Zuri Pi Wonders Why” series and is the perfect tool to help parents discuss preschool jitters with their toddlers. 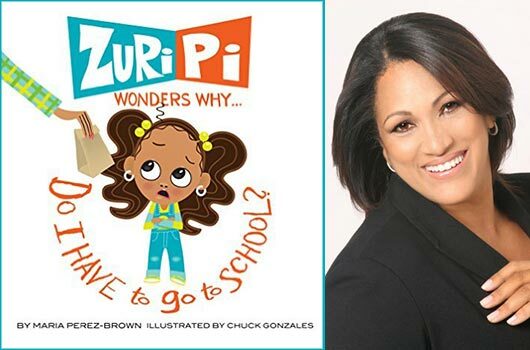 Written by the creator of the Emmy-nominated children’s television program Gullah-Gullah Island, the Puerto-Rican-born Maria Perez-Brown’s extensive work in television evidently gives this book its precise language, pace and perfectly thought-out message. With lively, modern, and adorable illustrations by Chuck Gonzales as well, this title will certainly stand out among your bookstore’s run-of-the-mill board books. Especially, since this may be the first book available about separation anxiety with a multiracial (Black and Latina) main character and her diverse cast of fellow preschoolers. As a children’s book that expertly tackles an issue that all toddlers struggle with—the desire to play on their own coupled with the need to know that their parents will always come back—Do I Have to Go to School was endorsed by Dr. Tovah P. Klein, Director of Barnard College Center for Toddler Development and author of How Toddlers Thrive. Perez-Brown penned the perfect mix of humor and reassurance that every young child will be able to relate to if they’ve ever dreaded school or the thought that their parents would somehow forget about them.